Discovery and development of 210 new molecular entities (NMEs; new drugs) approved by the US Food and Drug Administration 2010–2016 was facilitated by 3D structural information generated by structural biologists worldwide and distributed on an open-access basis by the PDB. The molecular targets for 94% of these NMEs are known. The PDB archive contains 5,914 structures containing one of the known targets and/or a new drug, providing structural coverage for 88% of the recently approved NMEs across all therapeutic areas. More than half of the 5,914 structures were published and made available by the PDB at no charge, with no restrictions on usage >10 years before drug approval. Citation analyses revealed that these 5,914 PDB structures significantly affected the very large body of publicly funded research reported in publications on the NME targets that motivated biopharmaceutical company investment in discovery and development programs that produced the NMEs. In an excellent publication "Where do recent small molecule clinical development candidates come from?" DOI, the authors give a detailed description on the development of clinical candidates from the initial hit. They also define the changes in physicochemical properties. An analysis of physicochemical properties on the hit-to-clinical pairs shows an average increase in molecular weight (ΔMW = +85) but no change in lipophilicity (ΔclogP = −0.2), although exceptions are noted. The majority (>50%) of clinical candidates were found to be structurally very different from their starting point and were more complex. I thought it might be interesting to look at the calculated properties of the 66 clinical candidates. Interestingly many have molecular weights > 500 and only around 30% contain an ionisable group. All structures contain an aromatic ring and 48 molecules contain 3 or more aromatic rings. In case anyone was wondering the high molecular weight compounds are not peptides or macrocycles. 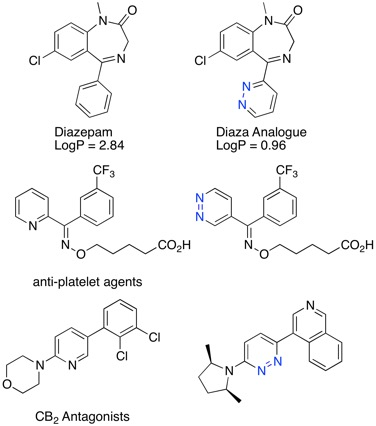 Bioisosteres are an essential tool in the medicinal chemistry toolkit. Bioisosteres are chemical substituents or groups with similar steric or electrostatic properties which produce broadly similar biological properties to another chemical compound. Bioisosteres won't always give improved properties, and sometimes we find that a transformation that improves metabolic stability in one series might have the reverse effect in another. However they provide useful (literature precedented) starting points for structural transformations that allow exploration of structure activity relationships. Sometimes they yield similar activity but offer alternative structural vectors for exploration, sometimes they simply improve solubility. I've now updated the bioisosteres section of the Drug Discovery Resources including new examples people have kindly sent to me. The ACS session organised by Division of Medicinal Chemistry includes a day of first disclosures of potential clinical candidates for the first time. Beth Halford was there and tweeted a series of hands drawn structures as they were disclosed. I've redrawn the structures and converted them into a single sdf file. I've also used Jupyter Notebook to calculate the physicochemical properties and plot them as shown in the image below. As can be seen, many of the compounds are on the large size with molecular weights >450, a third of them have ionisable groups which serves to bring down the calculated LogD. All molecules contain an aromatic ring, indeed many contain multiple rings. Interestingly we see a number of examples where a biphenyl ring system bears multiple ortho substituents presumably locking the two aryl rings orthogonal, no mention of atrope isomers though. This might also reduce the planarity and increase the 3D shape. The sdf file is available here FirstDisclosures.sdf.zip if anyone spots any errors in the structures please let me know. 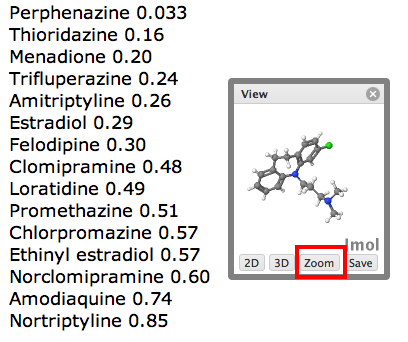 I've been updating the Drug Discovery Resources section. 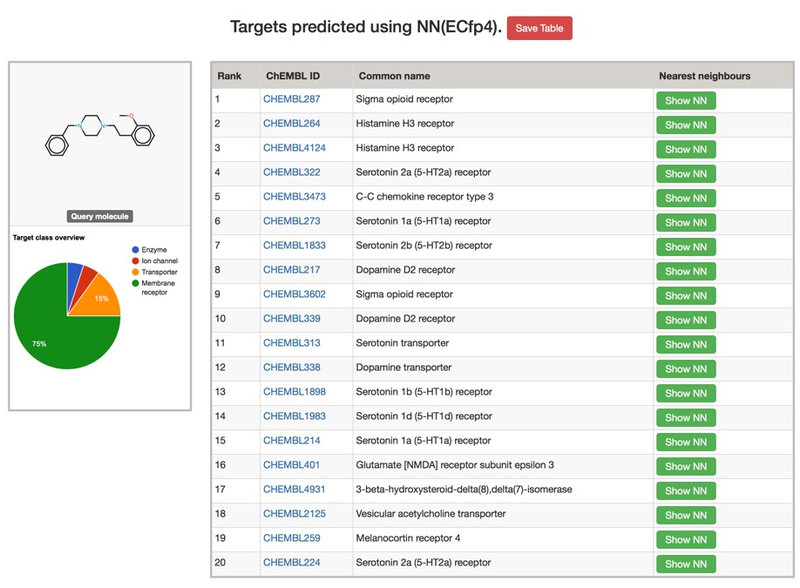 In particular I've added a section on target prediction tools, updated the section on Analysis of HTS data, and expanded the section on aggregation in bioassays to include a recent publication giving an example of target specific aggregation. The crystal structure showing the interaction is available (PDB 5MU8) and is displayed below using 3Dmol.js, the ligand (JNJ525) is shown in red.. In addition I've updated the section on molecular interactions. 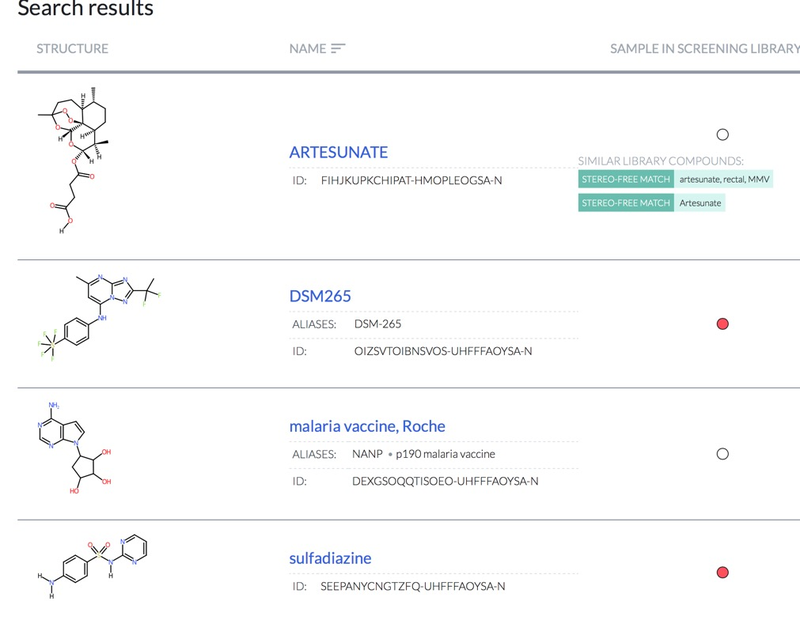 I've completed a few updates to the Drug Discovery Resources website, this includes fixing any broken links that people have mentioned to me, and also starting a new section in the Pre-clinical toxicity on Mutagenicity. 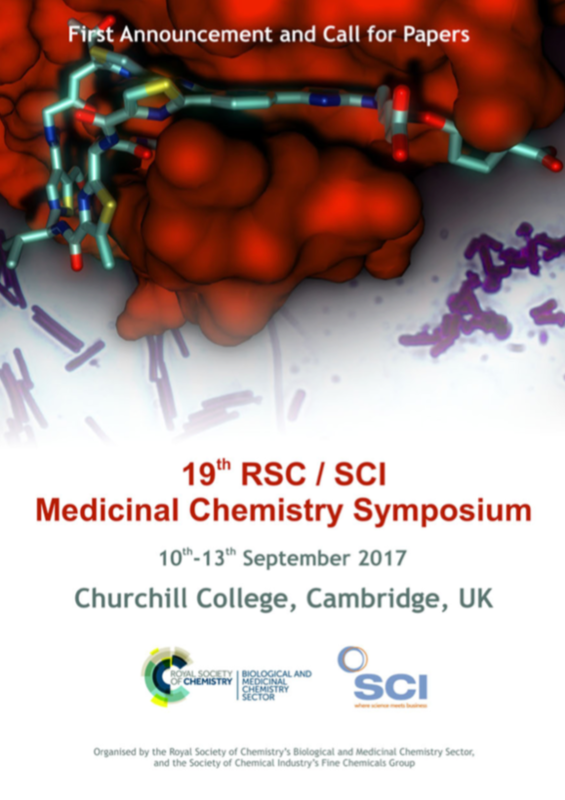 Still a few places left at the Cheminformatics for Drug Design: Data, Models & Tools meeting organised by SCI's Fine Chemicals Group and RSC's Chemical Information and Computer Applications Group has been extended. Sounds an excellent meeting and you will have a chance to look around the aircraft at the Duxford Imperial War Museum. 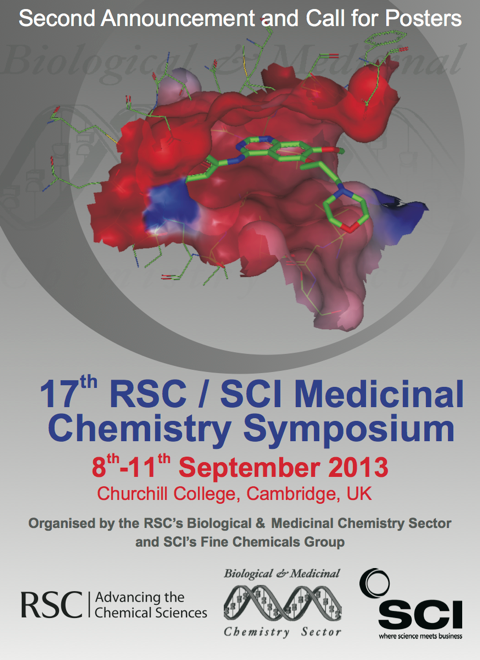 I’ve just heard that the poster deadline for the Cheminformatics for Drug Design: Data, Models & Tools meeting organised by SCI's Fine Chemicals Group and RSC's Chemical Information and Computer Applications Group has been extended. SDRI 2017 is a multi-disciplinary scientific conference for the Asia Pacific region focused on Solutions for Drug Resistant Infections. This inaugural conference theme is New Drugs for Drug-Resistant Infections. The conference will take place at the Brisbane Convention and Exhibition Centre in Australia from 3 - 5 April, 2017. The CO-ADD web portal is now live You can now submit your free antimicrobial screening request, download all forms and access your primary screening, cytotoxicity, hit confirmation and hit validation reports online on the new secure CO-ADD user portal. CO-ADD (Community for Open Antimicrobial Drug Discovery) is a not-for-profit initiative led by academics at The University of Queensland. Our goal is to screen compounds for antimicrobial activity for academic research groups for free. We aim to help researchers worldwide to find new, diverse compounds to combat drug-resistant infections. A little while ago I mentioned The Community for Open Antimicrobial Drug Discovery effort to provide free compound screening against a variety of infective agents. .
Primary Screening of a 1mg sample Test against key ESKAPE pathogens, E. coli, K. pneumoniae, A. baumannii, P. aeruginosa, S. aureus (MRSA), as well as the fungi C. neoformans and C. albicans, at a single concentration. It looks like they have achieved an important milestone! Thanks to our research community we have received 100,000 compounds from 30 countries in 15 months! Make a difference: clear the fridge, empty the shelves and send through your compounds for free antimicrobial screening against 5 bacteria and 2 fungi. We would also like to acknowledge the contribution of the French National Chemical Library that has safely arrived in Brisbane last week! 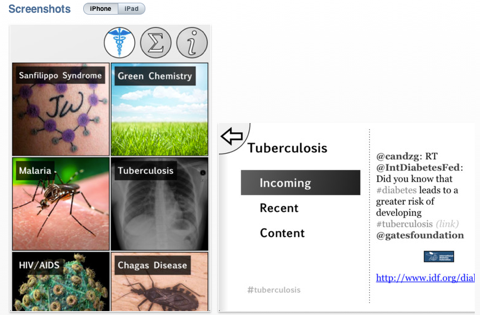 During 2016 Global Health are running a series of webinars on the subject of compound design. The programme for future meetings is available below (the agenda will develop through the year). Free webinar to discuss compound design. * Application of PK Tools in the optimisation of a series for the treatment of leishmaniasis, Gavin Whitlock, Sandexis, working with DNDi. I've expended the preclinical toxicity section to include a page on hepatotoxicity. This gives some details of the common assays and markers used to evaluate the potential hepatotoxicity. The concerns about antibiotic resistance are well known and indeed have made headlines in the mainstream press. Here is a chance to help find the next generation of antibiotics. Do you have interesting compounds sitting on the shelf? Perhaps you would be interested in having them screened for antibiotic activity for free? The Community for Open Antimicrobial Drug Discovery would like to hear from you, their goal is to screen compounds from academic research groups from anywhere in the world for free. We ask for 1-2 mg of pure compound which will be used for primary screening, hit confirmation, and if active will be used for a broader antimicrobial screening, cytotoxicity and a check for its purity. We require all compounds to be soluble in water or DMSO and to be shipped as dry material in appropriate containers, such as 1-2 mL Eppendorf tubes. For larger collections we can arrange plates or tube-racks. In the primary screen they test against against key ESKAPE pathogens, E. coli, K. pneumoniae, A. baumannii, P. aeruginosa, S. aureus (MRSA), as well as the fungi C. neoformans and C. albicans. 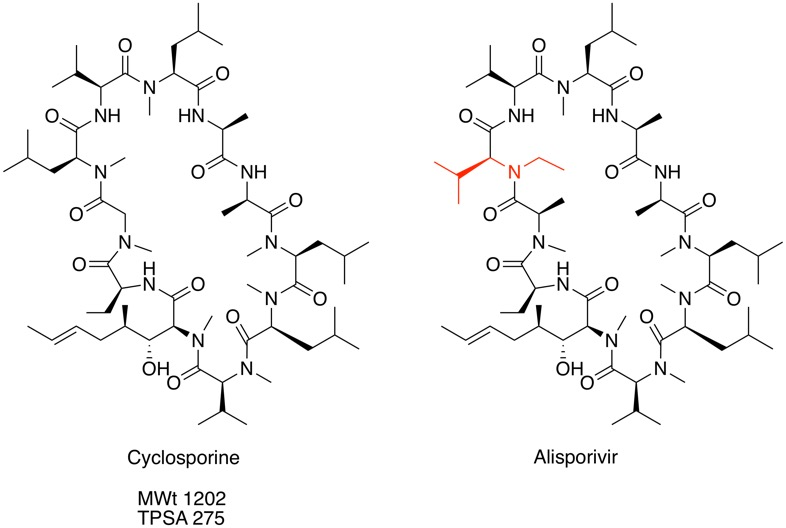 The ‘ESKAPE’ pathogens that are responsible for two-thirds of all health care-associated infections and resistant strains of these bacteria represent the greatest unmet need in antibacterial drug development. A recent paper from Douglas Kell et al DOI has provoked much discussion, especially since it was highlighted on In the Pipeline. The authors suggest that similarity to a human metabolite may be a useful as an indication of how “drug like” a molecule might be. We exploit the recent availability of a community reconstruction of the human metabolic network (‘Recon2’) to study how close in structural terms are marketed drugs to the nearest known metabolite(s) that Recon2 contains. While other encodings using different kinds of chemical fingerprints give greater differences, we find using the 166 Public MDL Molecular Access (MACCS) keys that 90 % of marketed drugs have a Tanimoto similarity of more than 0.5 to the (structurally) ‘nearest’ human metabolite. This suggests a ‘rule of 0.5’ mnemonic for assessing the metabolite-like properties that characterise successful, marketed drugs. Multiobjective clustering leads to a similar conclusion, while artificial (synthetic) structures are seen to be less human-metabolite-like. This ‘rule of 0.5’ may have considerable predictive value in chemical biology and drug discovery, and may represent a powerful filter for decision making processes. Whilst this represents an interesting observation I was rather concerned about the choice of a Tanimoto coefficient of 0.5, and decided to repeat the analysis. The recon-2 dataset was downloaded as a Matlab file, this was exported as a plain text file and Rajarshi Guha converted them to SMILES strings and removed duplicates (and did a comparison with PAINS). I imported these structures into a MOE database and then used a SVL script to compare the recon2 with several other datasets. 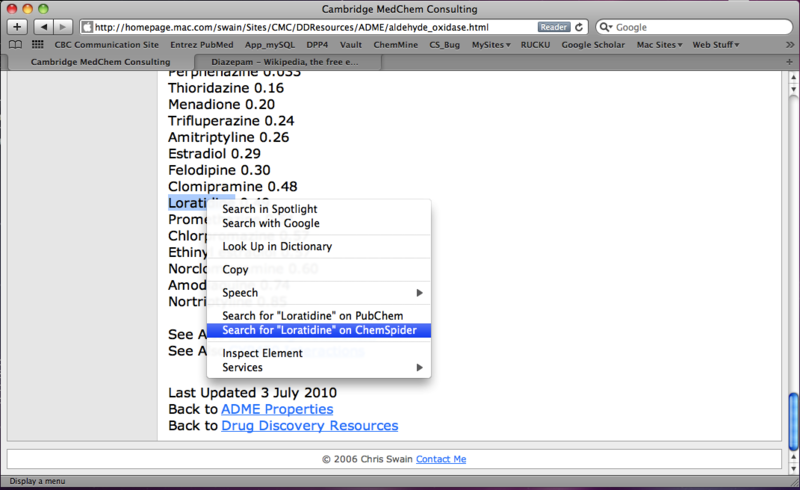 This included DrugBank that includes details of just under 7000 drug entries, a cleaned up subset of leadlike molecules from Zinc, and BindingDB a public, web-accessible database of measured binding affinities I downloaded in 2008. 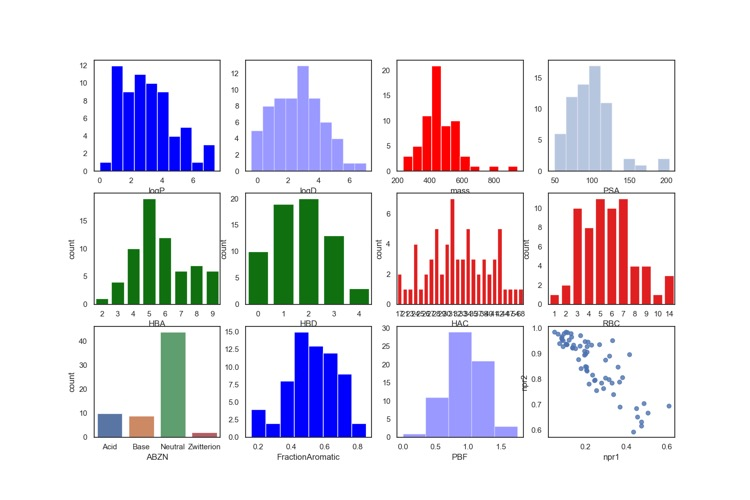 The datasets were first compared to each other using the MACCS fingerprints with a Tanimoto cutoff of 0.5. As the table above shows using a Tanimoto coefficient of 0.5 indeed 90% of the molecules in DrugBank are similar to a molecule in recon2, however the same is true for Zinc and BindingDB, indeed at a Tanimoto coefficient of 0.5 all the datasets are pretty similar. If we increase the Tanimoto coefficient to 0.85 we start to see some resolution, recon2 looks to have more overlap with DrugBank than with either Zinc or BindingDB. However this may simply be a reflection of the fact that DrugBank contains a significant proportion of natural product derived compounds. The key question of course is “Does this help us to identify compounds that are likely to fail in development?”. It would be really useful to compare with successful drugs and those that fail in development however I’m not aware of any dataset of of failed drug candidates (if anyone knows of one please let me know). 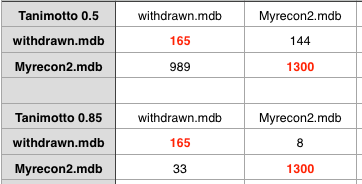 However to in an effort to perhaps get some insight I’ve compared the recon2 set with a dataset of drugs that have been withdrawn (for a variety of reasons). As might be expected using a Tanimoto coefficient of 0.5 offers little discrimination. Increasing to 0.85 it looks like there might be a signal there, but the dataset is too small for firm conclusions. In summary, this limited exploration suggests there may be something worth following up, but that a Tanimoto of 0.5 simply offers little discrimination. UK researchers will be granted access to a ‘virtual library’ of deprioritised pharmaceutical compounds through a new partnership between the Medical Research Council (MRC) and seven global drug companies, announced today by Business Secretary Vince Cable. AstraZeneca, GlaxoSmithKline, Janssen Research & Development LLC*, Lilly, Pfizer, Takeda and UCB will each offer up a number of their deprioritised molecules for use in new studies to improve our understanding of a range of diseases. A full list of available compounds will be published later this year, when UK scientists will be able to apply for MRC funding to use them in academic research projects. This has the potential to a really exciting resource for scientists to explore the pathways involved in a variety of different diseases, and since the compounds have apparently undergone some development it may provide a boon to those involved in repurposing drugs. Much will of course depend on the compounds offered but perhaps other companies will follow suit. If you want any further information I’d be happy to try and help. I spoke at the 25th Symposium on Medicinal Chemistry in Eastern England yesterday and gave a talk/demo on integrating Open Source software into Drug Discovery. As I promised at the meeting I’ve published the slide deck that now includes 25 pages on links and resources that I hope you will find useful. The origin of the pharmacophore concept. Any medicinal chemist will use the term “pharmacophore” to describe key features of a ligand binding interaction in 3D, but have you ever wondered where this important concept originated? Thanks to some detective work by Osman F. Güner and J. Phillip Bowen we now have a better idea who the concept originated and evolved. It is all described in a paper in J Chem. Inf. Model DOI. The IUPAC defines a pharmacophore to be "an ensemble of steric and electronic features that is necessary to ensure the optimal supramolecular interactions with a specific biological target and to trigger (or block) its biological response”. It is important to recognise that whilst a specific group of atoms may be used to define a pharmacophoric feature, the steric and electronic requirements can be mimicked by a completely different group of atoms. 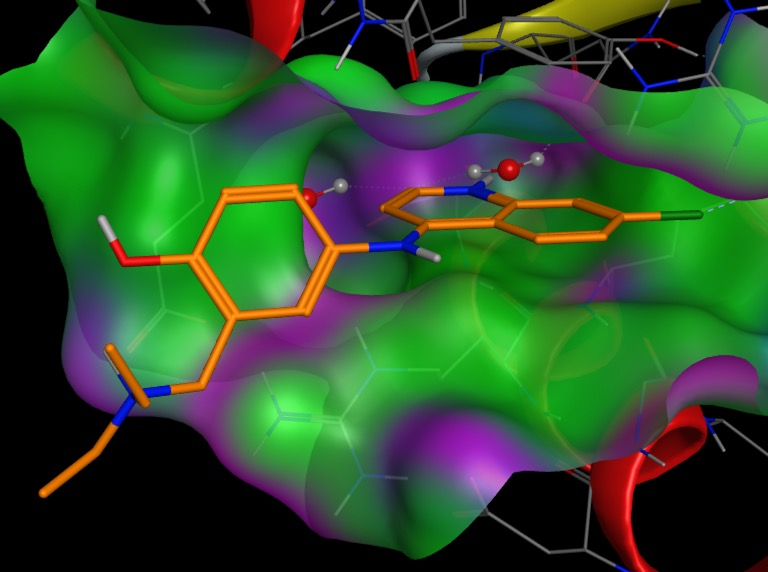 I’ve updated the Drug Discovery Resources to include a page on Kinase Inhibitors. I will be expanding it over the next week, so any comments or suggestions welcome. 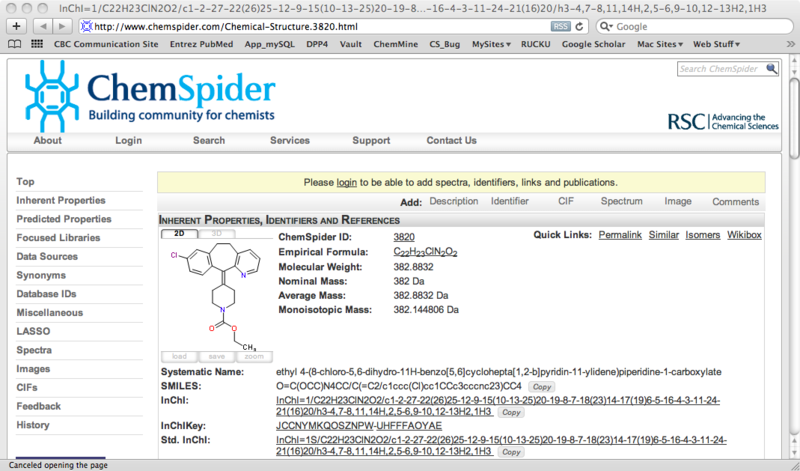 I’m in the process of updating the drug discovery resources pages. I’ve added a couple more examples to the bioisosteres pages and revamped the Computational Chemistry Tools page. I’ve also updated the Journal RSS feeds and included the feed for Chemical Biology and Drug Design. 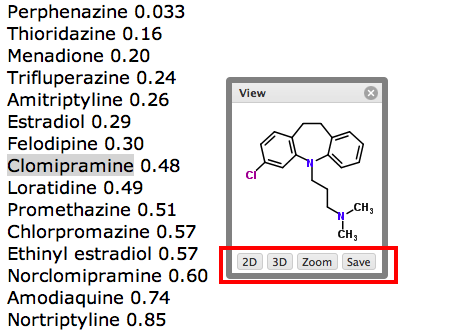 If you have ever wondered how Open Source Drug Discovery might work there is a very nice example on the Intermolecular blog here. I’ve just updated the page on building a screening collection and added links to recent useful publications. 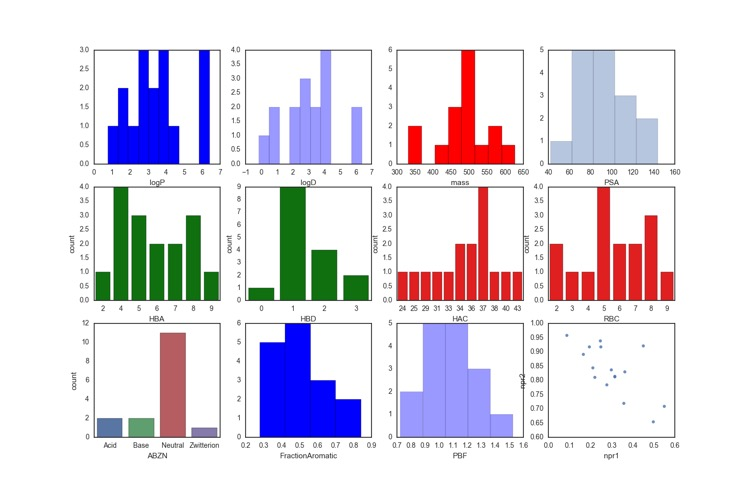 An interesting publication in the latest issue of Journal of Cheminformatics in which Melvin Yu uses Monte Carlo simulations to look at the Drug Discovery pipeline DOI. With any analysis of this kind it is easy to argue that it is too simplistic however it does raise some useful discussion points. In particular, the idea that simply attempting to improve drug discovery productivity by simply increasing the size of existing working groups may not necessarily be the best solution. Perhaps a greater number of independent smaller research units is a more attractive model? I recently wrote a review of ForgeV10 from Cresset in which I actually imported the results into Vortex to do the analysis. There were however two issues with doing this, firstly interpretation of the 3D structures is sometimes difficult, this can be resolved by creating a 2D rendering of the structure. The other issue is trying to interpret the docking pose whilst looking at the analysis of the results in say a Vortex scatter plot. I’ve been working with Mike Hartshorn and the people at Dotmatics who have incorporated OpenAstexViewer (a 3D molecule viewer) into the application you can read the full article here..
Whilst the Drug Discovery process is continuous and can vary depending on target it is often useful to split the process into stages with key milestones and targets clearly defined and met before a project moves from one stage to the next. I’m sure many of us have come across instances where introduction of a single methyl group results in an unexpected increase in affinity. If you have you might like this paper in J Med Chem. A literature analysis of >2000 cases reveals that an activity boost of a factor of 10 or more is found with an 8% frequency, and a 100-fold boost is a 1 in 200 event….The greatest improvements in activity arise from coupling the conformational gain with the burial of the methyl group in a hydrophobic region of the protein. I’ve updated the section on idiosyncratic toxicity to include more information on risk assessment strategies and the influence of clinical dose. I’ve just completed an addition to the Drug Discovery Resources, since fragment-based screening has increased in popularity I thought I’d have a look at available fragment collections. 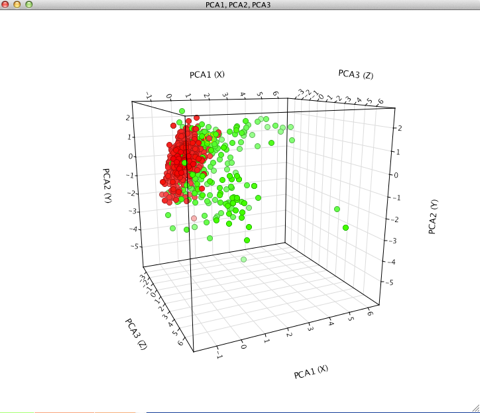 In particular, I looked at the overlap between collections, the physicochemical profiles and their diversity.